People keep asking me if we are ‘settled’ in our new home. My response? ‘Well I’ve unpacked my Vitamix, food processor, mini food processor, immersion blender, kitchenaid, coffee maker (and grinder), spice mill and waffle iron. I just can’t find any pants. Or my bed under the pile of boxes for that matter.’ But it’s ok because I’m at my inlaw’s house and it is heaven here. I just brought the pair of pants I was wearing. No one cares if you wear the same pairs of pants for 5 days in a row in Campbell river. We also still don’t have internet *gasp* hence the late post here. This week I was inspired by a new blog I stumbled across called The Full Helping. It features simply styled, yet beautiful vegan food. I picked recipes with lots of dark leafy green vegetables and tred to keep the recipes as fresh and light as possible to promote detoxification. In keeping with the guidelines for the Arbonne 30 days to Healthy living challenge I’ve also made tweaks to a few of these recipes (eg. substituted coconut aminos for soy sauce). Fennel and spinach quinoa salad with pomegranate and hemp seeds. Pomegranates are ridiculously high in antioxidants. Great for – you guessed it – detox! 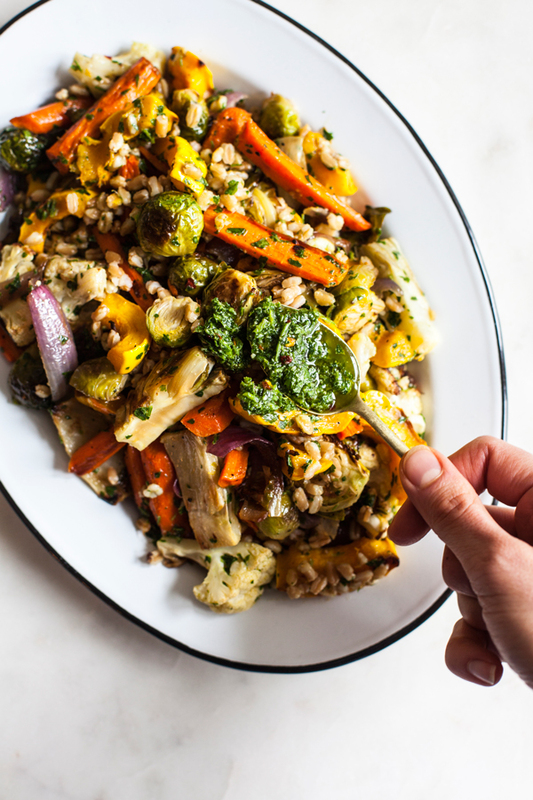 Farro and roasted vegetable bowl with Italian salsa verde. Farro is high is fibre and will promote detoxification of the GI tract. Creamy tomato coconut red lentil dal with wild rice. Fire roasted tomato and mung bean soup. Mung beans are a cherished food in Ayurvedic diets, and a great addition to any detox program. BONUS they are easier to digest that some of the more popular beans on the market so less unwanted beany-side effects. If you have any questions about the substitutions I made shoot me a message. Or if you just want to chat, also shoot me a message 🙂 I look forward seeing how I feel at the end of these 30 days.